Dell has released a pair of low-end notebooks with Ubuntu pre-installed. I picked up the 14 inch model. With the exception of a few software glitches I encountered during setup, I think the Dell Inspiron 14 3000 Series Laptop Ubuntu Edition is pretty great. Last year, I was looking for a new laptop. I wanted something inexpensive with decent specs and preferably without Windows. At the time, I wasn’t able to find an Ubuntu laptop in America that fit my needs and cost less than $400. I ended up buying a Toshiba Chromebook 2 for $320 (you can pick one up at Amazon. As much as I love my Chromebook and enjoy Chrome OS, I do find it quite limiting at times. So, back in January, I wrote a blog post begging computer makers to release a cheap Ubuntu notebook in the US. A couple of weeks ago, I was excited to see that Dell started taking orders for two low-end notebooks on their US store, the “Inspiron 15 3000 Series Laptop Ubuntu Edition” and “Inspiron 14 3000 Series Laptop Ubuntu Edition.” Considering that I had recently published an open letter to computer makers asking them for a low-end Ubuntu notebook, I decided to put my money where my mouth is and order one. I ordered the Inspiron 14 (3451, Early 2015) with an Intel Pentium N3540 processor and 4GB of RAM. I’ve been using this new Ubuntu notebook from Dell for a couple days, and overall, I’m pretty happy. For a $299 computer (that’s list price, I got mine for $249), it has reasonably good specs, looks nice, and performs about like you would expect considering the hardware and price. I did have some issues setting up Dell’s slightly modified version of Ubuntu (more on that later) and I wish that Dell had chosen to go with a small SSD instead of a painfully slow hard drive. Other than that, I couldn’t be much happier with my new $250 Ubuntu notebook. The 1366x768 screen is pretty nice for a notebook in this price range. It is an LED-backlit display with a glossy coating. It’s not nearly as bright as an IPS screen but has decent viewing angles and is bright enough for indoor use. It is a huge improvement over cheaper displays like those found in the Acer C720 Chromebook, but not nearly as bright and vibrant as the IPS display in the more expensive Toshiba Chromebook 2. Overall, I’ve found the screen to be acceptable. I decided to get the quad-core Pentium N3540 version since it came with 4GB of RAM. I haven’t encountered any situations where the processor was maxed out. Unless you are planning to do something like video encoding, this processor offers more than enough power. Actually, the dual-core Celeron N2840 that comes in the cheapest model (list price $249, but seen a low as $189) is probably powerful enough for most basic needs. The Celeron N2840 is a popular processor in Chromebooks and performs quite well. With the Pentium N3540, I feel like the processor has some room to breath. I didn’t go with the cheapest model because it only comes with 2GB of memory. Running Ubuntu with 2 GB of RAM is just not realistic and even with 4GB of memory, the system quickly begins to use swap space after you open more than a few Chrome tabs. When the system starts using swap, tasks like opening new applications and opening and closing browser tabs become noticeably sluggish. If there is one major flaw with this notebook, it is the inclusion of a 500 GB 5400 RPM hard drive. The hard drive is by far the slowest component in the device, creating a big performance bottleneck. I know that these types of drive are by far the cheapest option for storage these days, but I would much rather have a small SSD over a larger and much slower hard drive. On the bright side, the hard drive is easily accessible and upgradeable, so if you are looking for performance, you can swap the HDD out with a 2.5” SATA SSD. The Inspiron 14 has a pretty standard chiclet style keyboard. The keys have a decent amount of travel and are spaced nicely. The function keys and the media keys are combined which is a bit of a pain but also pretty standard on modern laptops. The touchpad is large and has a good feel to it. The major problem with the touchpad is that it’s incredibly sensitive and is susceptible to accidental clicks while typing. I don’t know if that is a problem of the touchpad or with Ubuntu, but it’s rather annoying to constantly have your cursor jumping around the screen while you’re typing because your palm accidentally brushed up against the touchpad. The 40 WHr, 4-Cell removable battery isn’t big enough to keep the notebook running all day long. Ubuntu shutdown after about 4 hours of web surfing and watching online videos. That’s not nearly enough juice to get you through a workday or even a long flight. The Inspiron 14 does have a fan which blows warm air out the left side of the computer. In my limited usage, the computer never got very warm, even when using it on my lap. When the fan kicks on, it’s not too loud and hardly even noticeable. This is pretty typical for notebooks with Intel’s Bay Trail mobile processors. The speakers face out the front of the laptop and are reasonably loud and clear but tinny with poor low end. The sound is not as good as Toshiba Chromebook 2 but better than most low-end notebooks. For watching videos without much music, the speakers are acceptable. Once you start trying to listen to music, however, you’ll find the speakers severely lacking. The 802.11b/g/n 2.4 GHz Atheros wireless card is nothing to write home about, but it is stable and gets the job done. I haven’t experienced any disconnections or problems with signal strength. The Qualcomm Atheros QCA9565 / AR9565 card utilizes the ath9k kernel driver. If you would like to upgrade to a better card in the future, it looks easy enough to replace. The card also provides Bluetooth 4.0, and in my limited testing, it works quite well with Ubuntu. There is not an Ethernet port, but if you need one, you can use an inexpensive adapter like this one from Pluggable. The Inspiron 14 also includes one USB 3.0 port, two USB 2 ports, a full-sized HDMI out port for connecting an external monitor, a headphone/microphone combo jack and an SD card reader. These are pretty standard ports on any modern notebook, so nothing out of the usual here. What really sets this computer apart from the rest of the cheap laptops out there is that it comes preinstalled with Ubuntu 14.04 LTS. However, it’s not exactly a stock version of Ubuntu as Dell (presumably with the help of Canonical) have changed a few things here and there. How does Dell’s version of Ubuntu stack up against the normal install-it-yourself Ubuntu that so many of us are accustomed to? Things start out well on first boot with a really cool startup animation and music. After the video ends, you’re presented with a EULA and asked some basic setup questions. At the end of the normal setup questions, you’re asked if you’d like to make a restore disk. I decided to try out this feature and put a USB flash drive in the computer as directed. This is where things started to go really bad. Unfortunately, the setup utility failed to create a restore disk for me, and not only that, but it crashed! I was forced to reboot the computer, unsure if my computer was fully set up or not. After rebooting, I was able to log in and everything seemed to be okay. But trouble continued when I tried to update the system. Software Updater crashed and failed to do an initial update. Then I was shown a cryptic error message in the notification area and prompted to run apt-get in a terminal. As an experienced Ubuntu user, I opened a terminal and ran “sudo apt-get -f install” to fix the problem. I then ran Software Updater again and this time it froze before finishing the updates. After yet another reboot, I was finally able to get all the updates installed. The initial setup and update process on this computer was a complete disaster. New users to Ubuntu should not be greeted with crashes, freezes and prompts to run commands in the Terminal! Compared with the setup process of Chromebooks or even Windows laptops, this Dell Ubuntu experience was not only embarrassing, but completely unacceptable. Upon further digging, I found that Dell and Canonical have included a special APT software repository for Dell computers. The majority of the packages installed from this repo seem to be related to the OEM setup tools. These packages, apparently intended to help with the setup of pre-installed Ubuntu laptops, need some more attention and testing. Dell has also installed a few small utilities like the Dell Recovery app (which repeatedly failed to create a recovery USB drive, but did eventually create a recovery ISO file for me), a driver installer to help you install drivers downloaded from the Dell website (of which there are none currently needed or available), and a few nice things like the Fluendo mp3 codecs. 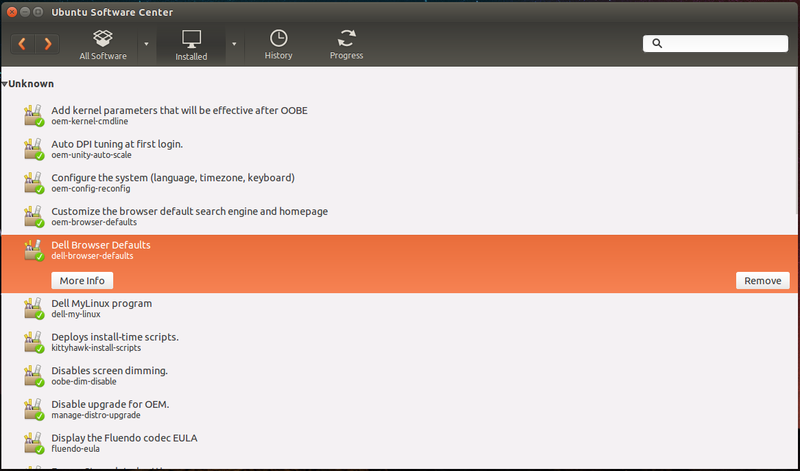 Once you get past the initial setup and update, everything seems pretty much like a standard Ubuntu 14.04 installation. The only notable exception is the inclusion of Google’s Chrome browser instead of Firefox. The system sleeps and wakes flawlessly when closing and opening the lid, and I haven’t noticed any hardware glitches. The notebook has been very stable and Ubuntu just works like you would expect. Overall, I’m very happy with the Inspiron 14 Ubuntu Edition. In my original blog post, I said that I wanted a notebook that cost $300 to $450, and Dell delivered a pretty solid computer for significantly less! Even if I upgraded to an SSD, I’d still be well within a reasonable price range. I’m incredibly thankful to Dell for taking a chance on selling Ubuntu to mainstream US consumers. They are potentially putting Ubuntu in the hands of many new users who might just call them for support, and supporting Ubuntu is a pretty big investment on their part. I wish Dell all the luck in the world with this project and hope that other Linux enthusiasts will support Dell the next time they’re looking for a laptop. I also hope that Dell’s offerings will help push Ubuntu further into the mainstream in America. Even with all the initial setup problems that I encountered, I would still recommend this notebook for anyone looking to run Linux on a decent, but inexpensive laptop. I think it will be great for everyday mobile computing, for watching Youtube and Netflix on the couch, and should make a great first notebook for my son. If Dell and Canonical can get the setup issues fixed, this could be a great Ubuntu computer for the masses.